what would it be and what would you do with it?" Beaverbrooks and Trollbeads UK asked attendees the first question in person... and Curling Stones was waiting in the wings to find out what happened after the event! 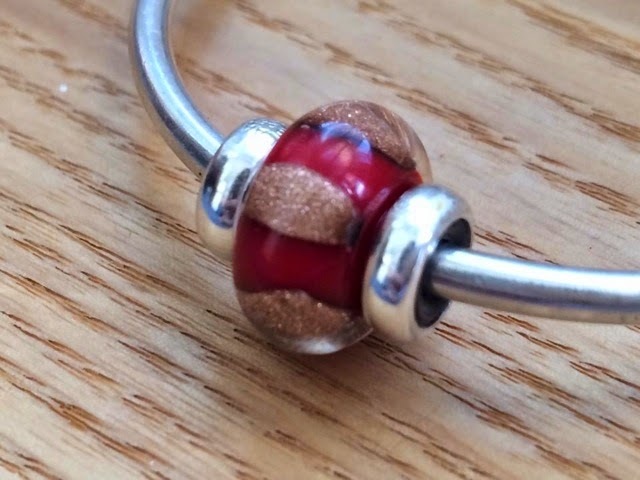 "Beaverbrooks staff were excited to have a beadmaker on site and our group all chose to have the same style bead made, but in different colours. 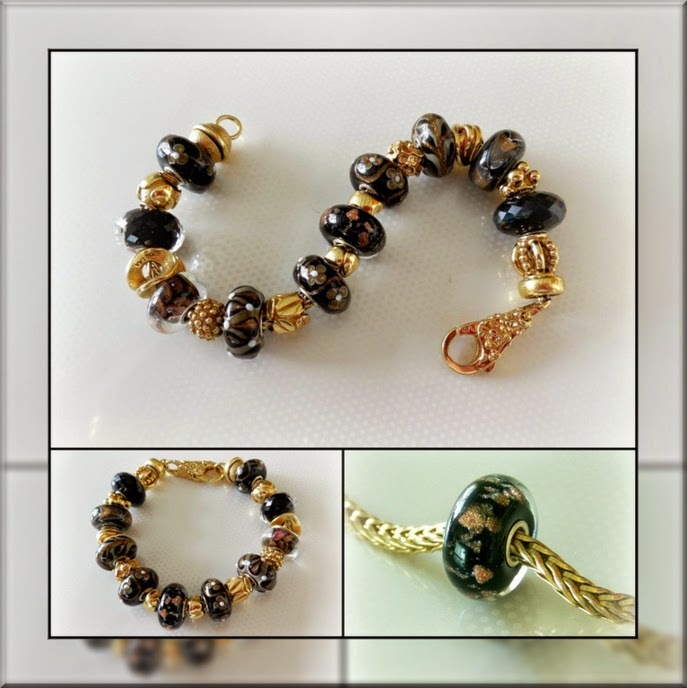 Mine is black with gold dust and I actually opted for this bead after seeing it on the wrist of one of the ladies from TB UK, I thought it worked well." Angela has an incredible collection of beads and I think her choice of beadmaker bead certainly matches the rest of her collection very well! 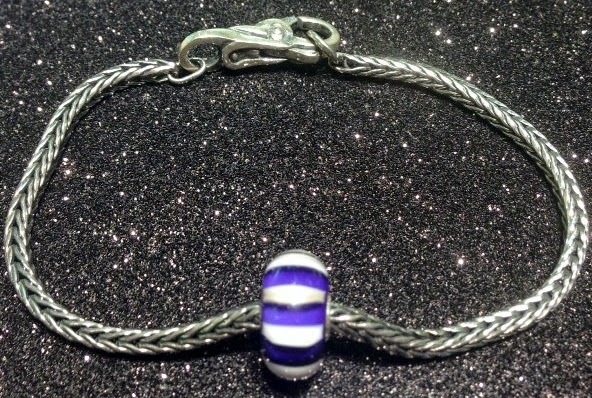 "I was so excited to have the opportunity of getting a bead made for me. Especially as it gave me the chance to create something unique to remind me of a very special occasion, my eldest son's wedding. The choice of colour was an easy one as I needed the bead to go on the bracelet I was putting together to match my wedding outfit. So off I went armed with a sample swatch of the colour of my dress in the hope my wish could be fulfilled. I was in luck, I could see amongst the bead maker's rods one that looked perfect. However on chatting to the talented lady she told me she had had a few problems when working with this colour on a previous bead. It was producing dirty blackish marks in the glass and she didn't know why and was reluctant to use it. I think she saw the disappointment in my face and came up with a solution.....she would add glitter to disguise them! The dots were then added to the top to symbolise 'stepping stones ' to the next stage of his life, hopefully on a path of never ending happiness. I left the shop a very happy lady." "Over the years, I have been lucky enough to have several beads made for me by Georgina Black, the Trollbeads UK lampworker who has now returned to Canada. 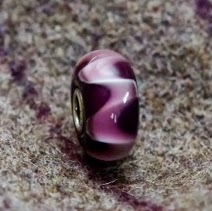 Georgina was replaced by Sue, and this was to be her very first bead for me, as I didn't get a beadmaker slot at the last UK Trollbeads Convention in 2013, when Sue started. I was in a bit of a lime phase over the summer... you can also see one of my other beadmaker beads in the photo below - the black flower on lime - which was designed by me and made by Georgina, and so I decided after much debate with trollie friends that I wanted a white armadillo with lime lines (We spend hours beforehand debating our choices!). However, when I got to Beaverbrooks for the event and saw some of the beads Sue had made earlier for the staff, I decided to go for a lime and gold splodge bead instead! A bit like the Oranje Boven only in lime. ...and even better to see the finished result. When the bead arrived back after being cored in Denmark, I found that it was a lovely fresh apple green colour instead of lime. I didn't mind at all because the colour is beautiful, and I know that colours can be difficult to get right with lampworking. I know that my friends had similar designs made in different colours, and they are great beads too! Thank you, Sue and Beaverbrooks!" "I laughed when I read Amanda's "We spend hours beforehand debating our choices!" 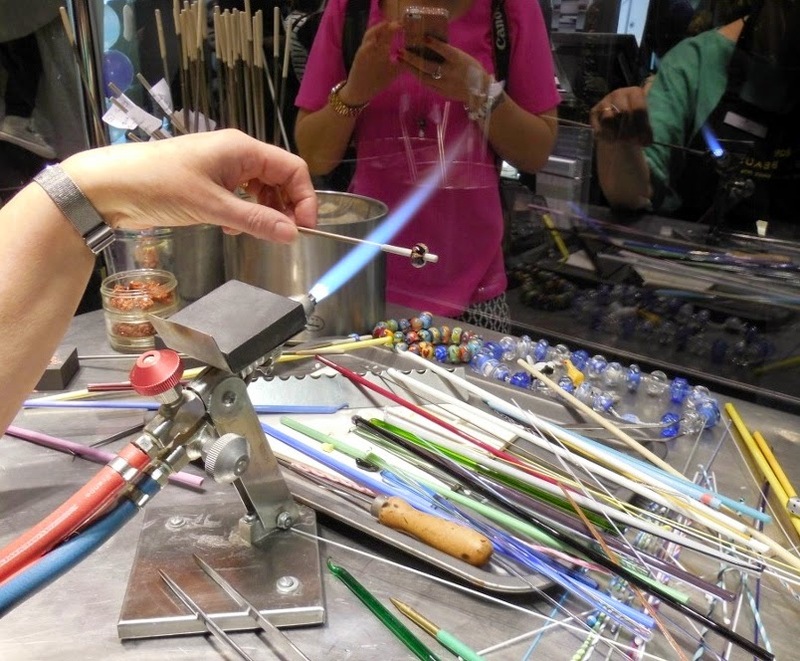 - so did I, on the day itself I was still struggling with my choices and not knowing what glass rods Sue had with her (so I couldn't choose in person), I sent a few suggestions down to Bristol and deliberately didn't ask which one was made so that it would be a surprise when it arrived. I love surprises! Finally I got the message that all the beads had been cored and returned, and in mid-June I waited for my bead to arrive! Having just got back from my holiday and also having just seen my bus for the first time, to say I was a bit excited was an understatement; what an amazing week that was! So which design had Sue chosen to make? 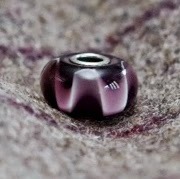 Purple translucent bead with glitter in it! I love purple and I'm always on the look out for deeper purples, so I was pleased to add another to my collection! What did I do with my bead? Well I've actually been wearing it ever since on a very special bracelet, nestled within the In Your Heart Charm... on my Bus Bracelet! Although I had no idea what to expect when I was throwing ideas out into the ether for my bead, I couldn't have been more delighted with what I received and the timing of it coming. It's the perfect purple to match my bus and the gold glitter really reminds me of the wooden interior, especially how it looks when the light catches it in the late afternoon/early evening sun." Now it's in my bracelet combination I'm actually happier it's not purple and green!" 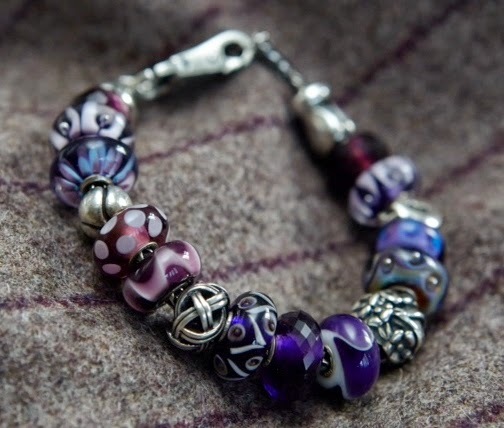 I really like what Carol has done with her bead, I think she's chosen such lovely beads to make this bracelet and I adore the combination; beautiful! P.s. I think it would also go very well in my bus bracelet! "This is my bead, it turned out to be a deeper red than I was expecting but I was really pleased with it, it's my red boven! 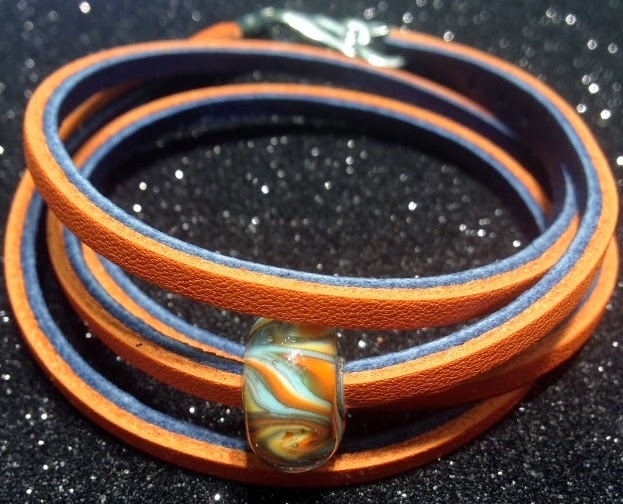 I was originally intending to put it on another bracelet, but when it arrived it really did look like it was especially made for this bracelet, so I took out the original focal bead and now my beadmaker bead takes pride of place." I'm not normally one for darker red beads (I've been having a bright red phase myself) but I think I've fallen a little bit in love with Helen's bead, it's not a colour I've seen a lot of but I adore it! Now most of you won't know (and Adam probably wouldn't remember) but he was actually the member of the Beaverbrooks Cribbs Causeway team who sold me 3 beads back in August 2012! We had a really lovely chat about his (then) recent trip to Trollbeads UK Headquarters which I had just read about; I felt like I was talking to Trollbeads royalty! "Adam choose to have this bead made to compliment his bracelet which is mostly made up of beads of his favourite colour "Blue". The orange was implemented due to him visiting Amsterdam and having an orange bead to commemorate his holiday, so he asked for some orange to be added. Even the shop had a bead made! I like that the shop has had a bead made... especially as I'm the woman who made a bracelet to represent her bus! I wonder who gets to wear this one or if everyone has to take it in turns?! I knew there was a question I forgot to ask! I personally loved seeing and hearing about everyone's beads and designs, I'm so nosy curious! I love this part of my job at Curling Stones and I hope you've enjoyed reading about them! Big thanks again to the Beaverbrooks Team, Sue, Trollbeads UK and Angela, Tracy, Amanda, Carol, Helen, Adam and Sara (representing Beaverbrooks) for sharing their photos and stories - fabulous beads and bracelets! Thanks for this great article! I don't know Tracy, but that is the bead I think I like best of all those made by Sue, because it was made for such a very special occasion and goes so beautifully - I adore her bangle and bracelet to match her lovely outfit. Of course, all the others are wonderful too, and I am so surprised that you got a "Purple Boven" - many of us went for the same design! Having said that, I also love Carol's wave bead - and I've also seen Adam's IRL - it is amazing. I think that all the staff in the shop got a Beaverbrooks bead, but I may be wrong. I also did a double take at all your Bovens... made me smile but I couldn't tell anyone as I didn't want to spoil the surprise! Thanks you Mars for writing such a great article on the Beaverbrooks event. I have really enjoyed reading it through and especially enjoyed looking at everyones wonderful beads and fantastic combinations. Thanks Helen, loved your gorgeous red bead and beautiful bracelet! 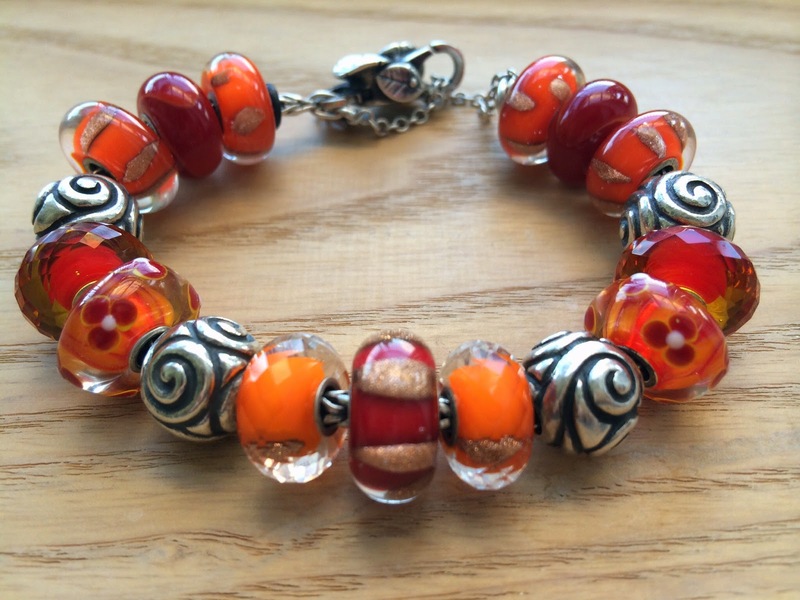 I've been converted over to orange by my friend Alison and adore the combo you put together, it really does look like it was made to be the focal bead! Oh that's interesting on the not replicating a production bead? Lake Eye has always been one of my favourite beads, and was one of my first too. I'd love more colours with that clarity of bubbles that you get in production Lake Eye in other jewel tones. I found it hard to narrow my choices down though, in some ways probably not seeing what rods Sue had with her perhaps was easier than actually being there?